I'm interested in a lot of things but I love bikes. I like to ride 'em and I like to wrench on 'em. Where else can you put this stuff except under "Other"-? I've been working on this bike for over 2 years now. It has been a challenge every step of the way. From the BB to the bars; every time I conquer one problem I find two others. Here in December of 2012 though, I am very close to having a rideable bike. I bought this bike for $20 on the Fourth of July 2011. Bought the wheelset off eBay for $115 delivered. The bars, crankset, levers, sealed BB, chain, pedals, and tires were all found used on Craigslist. The saddle, calipers and headset are all original to the bike. 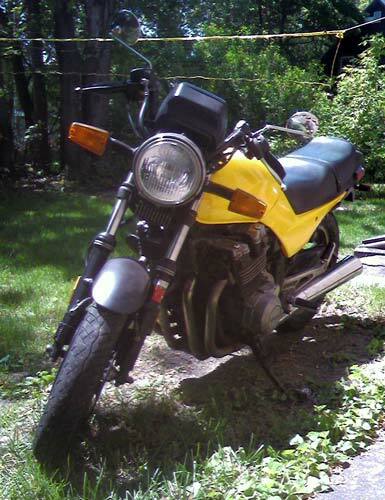 This is my 1985 Suzuki GS700e - I bought this bike in January of 2007, it is my first motorcycle and the bike I rode on my Quarter Century Trip. Last winter I took a "Learn To Wrench" course and gave her a good going over. The paint job I did myself; I have a thing for yellow bikes. I built this bike for someone I used to know. It is an old Empire Bike; I don't know much about the brand but it used to be a 27in road bike that I converted into a single speed coaster brake. 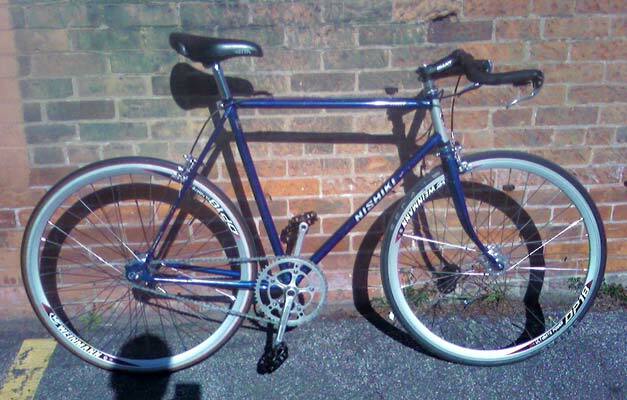 When we bought the bike it had been stolen and painted blue, the original paint was a nice white. I stripped it to bare metal and repainted it yellow. The bars, saddle, pedals, chain, rims, tires and stem are all new. Regrettably, I was not able to replace the cotter pin crank set before the bike had to travel cross-country. Probably my finest build to date.